The Tongan Prime Minister has been greeted with a Sipi Tau war challenge during a visit to Tongan troops working with the RAF in Helmand. His Excellency Lord Tu’ivakano, Prime Minister and Minister for Foreign Affairs of Tonga, met senior US and UK commanders before spending time with troops to learn about the contribution his nation is making to the International Security Assistance Force (ISAF) mission. 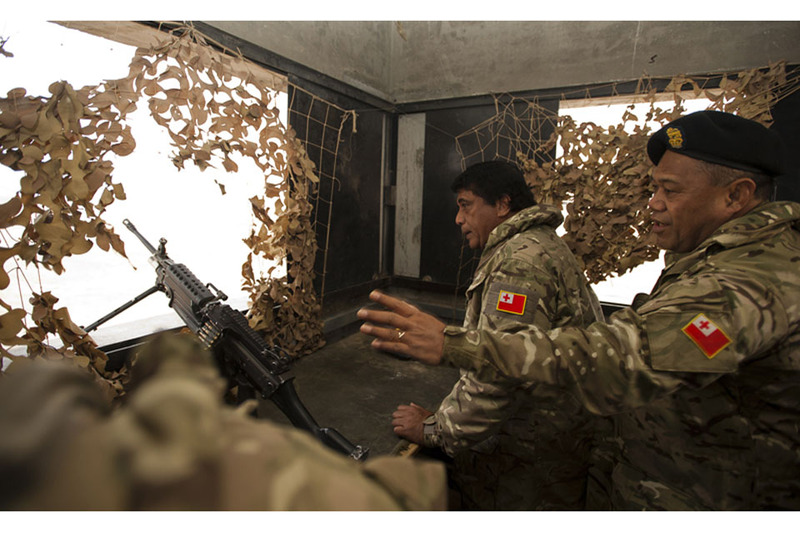 The Tonga Defence Services has served as part of the Camp Bastion Force Protection Wing since November 2010. 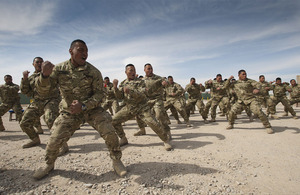 The 55 personnel serve alongside members of the RAF Police and RAF Regiment to provide security for Camp Bastion’s main entry points, perimeter, and airfield. Accompanying the Tongan Prime Minister on the three-day visit to Camp Bastion were People’s Representative Semisi Palu ‘Ifoni Tapueluelu, and Brigadier General Tau’aika ‘Uta’atu, Commander of the Tonga Defence Services. The party was met by the Commander of the Joint Operating Base, Group Captain David Waddington, before heading out to the perimeter fence to get an overview of his units’ wider role and responsibilities. The Tongan soldiers do a vital job at Camp Bastion as part of our security forces, so it was a great honour and pleasure to welcome their Prime Minister to show him how we work side by side and how much we appreciate their contribution. We welcome and were honoured by the PM visit to Camp Bastion. The PM and his delegation had the opportunity to see Tonga’s contribution to ISAF and the close mutual co-operation between the Tonga Defence Services and the British forces in Camp Bastion. We are proud and honoured to contribute to the security and protection of Camp Bastion with the Force Protection Wing. We are fully aware of the importance of our roles and every man in the deployment is doing his utmost to ensure that the roles are carried out diligently. The trip follows a recent UK visit where the Tongan Prime Minister met the Armed Forces Minister Nick Harvey and inspected a ceremonial guard from the Household Cavalry Mounted Regiment. It was a unique experience to see my troops in Afghanistan. To learn from a two-star general down to a private soldier how well my contingent were performing and contributing to the international mission. I would like to thank everyone for making the trip possible and I look forward to returning to Tonga to inform the King, Parliament and the Tongan people of my experience.